Xavier School of Human Resource Management (XSHRM), Xavier University Bhubaneswar (XUB) hosted one of a kind Industrial Relations Conference on “Make-in India Initiatives and Changing Paradigms of Industrial Relations”. 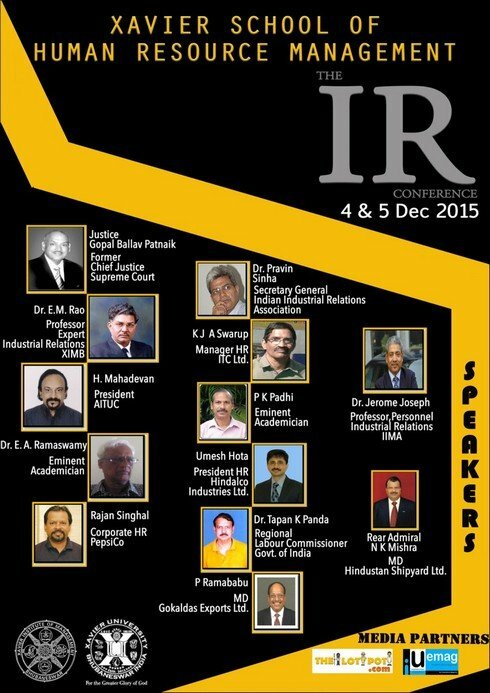 The conference was held on 4th and 5th December, 2015 at the XIMB Campus and the Xavier City Campus respectively. It was a National Level IR Summit aimed to stimulate discussions between the student community and industry personnel in order to get first hand insights from eminent luminaries by giving students a new perspective on existing and emerging industrial situations. The two day event witnessed panel discussions focusing on the key issues of Re-positioning of IR in the context of Make-in-India Initiative, Labour Reforms, Problems of Handling Disciplinary Issues of Contract Labour, Contractualisation of Managerial Personnel and various other related issues, spread across different sessions. Some of the eminent speakers and dignitaries were Justice GopalBallavPatnaik, Former Chief Justice of Supreme Court of India (32nd Chief Justice of India); Dr. E.M. Rao, former Dean XLRI, former Professor XIMB; Mr. H. Mahadevan, President, All India Trade Union Congress (AITUC); Dr. E.A. Ramaswamy, former Professor, Institute of Social Studies, The Hague and former Professor IIM, Bangalore; Mr. RajanSinghal, Executive Director - Corporate HR, Varun Beverages Limited; Dr. Jerome Joseph, Sociologist and Industrial Relations Commentator; Dr. Tapas Kumar Panda, Regional Labour Commissioner (Central); Mr. P. Ramababu, Vice Chairman &ManagingDirector, Gokaldas Exports Ltd.; Dr. Pravin Sinha, Secretary General, IIRA and Senior Advisor, FES India; Dr. P.K. Padhi, Professor, XLRI; Mr. UmeshHota, President- HR, Hindalco Industries Limited; Mr. K.J.A. Swarup, Deputy General Manager, ITC LTd., PSPD; Dr. SarojMohapatra, President-HR, Bajaj Power Group; Rear Admiral N.K. Mishra, Chairman and Managing Director, Hindustan Shipyard Limited; Mr. G.P Rao, Founder and Managing Partner, Good People Relations (GPR HR Consulting); Dr. D.P Kar, Adjunct Professor, Xavier School of Human Resource Management; Dr. B.B Mohanty, Former Professor, Department of PM & IR, Utkal University; Mr. Aditya Dash, Managing Director, Ram's Assorted Cold Storage Limited; Mr. SarojSahu, Director-Finance, B.Engineers and Builders Limited; Mr. Aditya Das, General Manager-HR, Milk Mantra; Mr. TapanMohanty, Managing Director, Z Estates Pvt. Ltd.
Xavier University, Bhubaneswar (XUB) was established in accordance with the Xavier University Act 2013 and was inaugurated on the 7th of July 2014. The University is India’s first digital University and an institution of higher learning for imparting professional and technical education.It is a self-financing institution of higher learning for imparting professional and technical education.XUB offers its Masters in Business Management through its flagship school, XIMB. It also offers Masters in Human Resource Managementthrough Xavier School of Human Resource Management, Rural Management through Xavier School of Rural Management, Sustainability Management through Xavier School of Sustainability and graduate programme in commerce through Xavier School of Commerce. Apart from theseit has proposed to set up other schools of higher learning in various areas like Public Policy, Sustainability, Media & Communications, Finance, Education and Centers of Research in Public Policy & others. XIMB, a 28 years old business school of global repute is the Flagship School of Xavier University. Inspired by the Jesuit spirit of ‘Magis’, or excellence, XIMB strives to be a premier institute globally recognized for management education, training, research, and consulting that help build a just and humane society. The Institute today has become widely recognized for its excellence in imparting management education. It is counted among the leading management institutions in the country. The Xavier School of Human Resource Management (XSHRM), owes its origin to XIMB’s HR specialization program. It continues the legacy of shaping HR professionals since 1987.